We’re excited to announce that Beauty Box Video 4.0 is now available for Avid and OpenFX Apps: Davinci Resolve, Assimilate Scratch, Sony Vegas, NUKE, and more. This is in addition to After Effects, Premiere Pro, and Final Cut Pro which were announced in April. Beauty Box Video 4.0 adds real time rendering to the high quality, automatic skin retouching that Beauty Box is famous for. It’s not only the best retouching plugin available but it’s now one of the fastest, especially on newer graphics cards like the Nvidia GTX 980. We’re seeing real time or near real time performance in Premiere Pro, Resolve, and FCP. Other apps may not see quite that performance but they still get a significant speed increase over what was possible in Beauty Box 3.0. 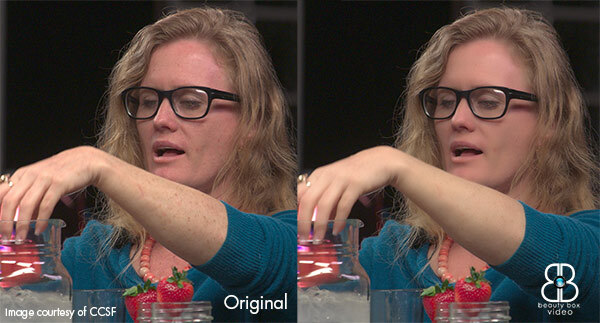 Easily being able to retouch video is becoming increasingly important. HD is everywhere and 4K is widely available allowing viewers to see more detail on closeups of talent than ever before. This makes skin or makeup problems much more visible and being able to apply digital makeup easily is critical to high quality productions. Beauty Box will smooth out all skin areas, so blemishes on arms are covered up as well as wrinkles or spots on the face, as you can see in this still from a cooking show. So head over to digitalanarchy.com for more info and to download a free trial and free tutorials on how to get started and more advanced topics. You’ll be blown away by the ease of use, high quality retouching, and now… speed!